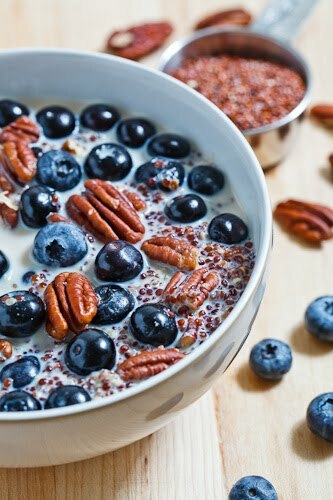 Quinoa served as a breakfast porridge with blueberries, pecans and a touch of maple syrup. Bring the quinoa, milk, vanilla, cinnamon and maple syrup to a boil, reduce the heat and simmer, covered until tender, about 15 minutes. Mix in the blueberries, add more mil to taste and top with the pecans.